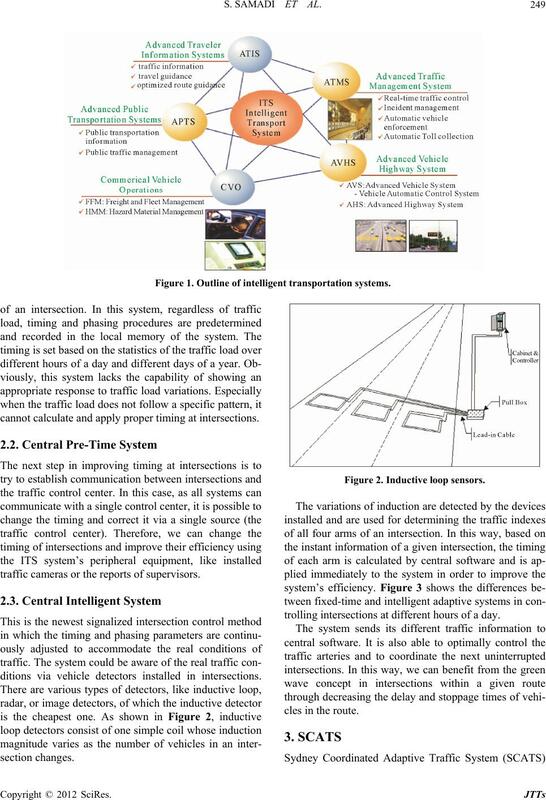 traffic control system was introduced as the selected intelligent control system for integrating signalized intersections. 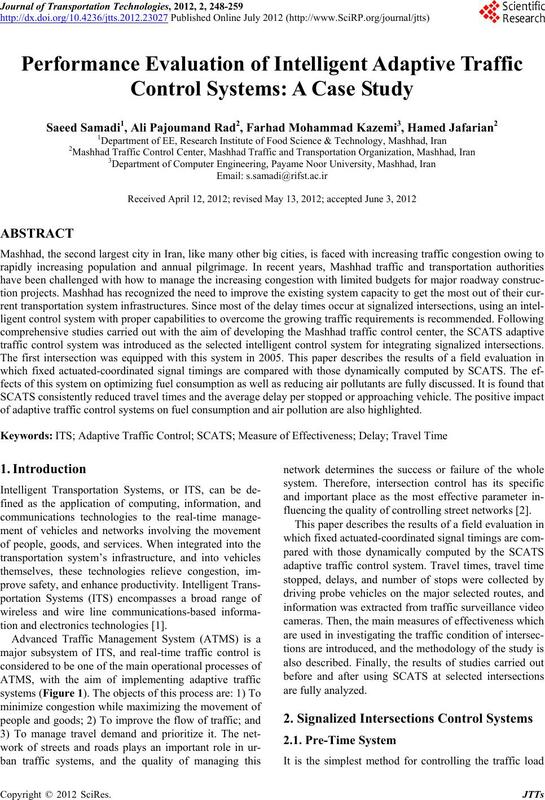 of adaptive traffic control systems on fuel consumption and air pollution are also highlighted. tion and electronics technologies . fluencing the quality o f controlling street networks . Figure 1. 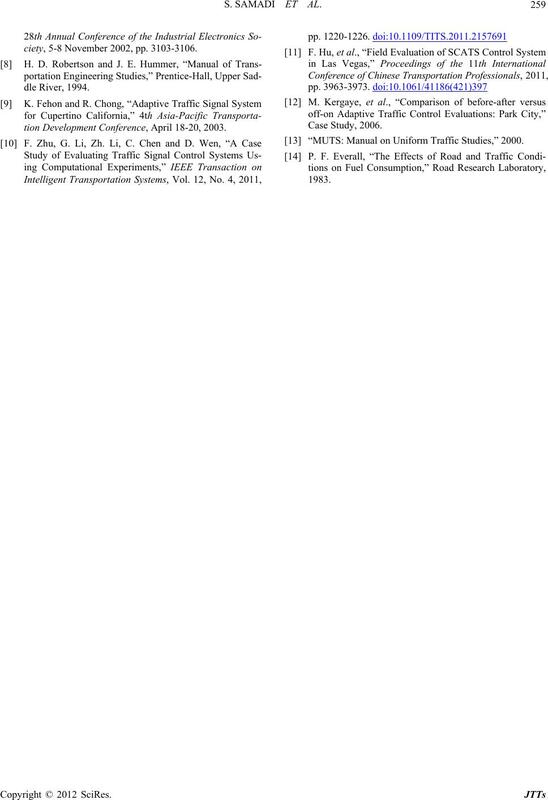 Outline of intelligent transportation systems. 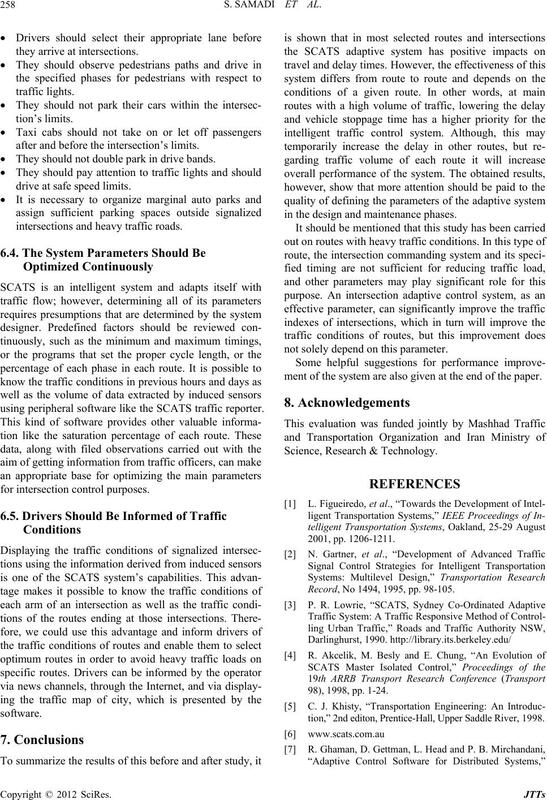 cannot calculate and ap ply proper timing at intersections. traffic cameras or the reports of supervisors. ditions via vehicle detectors installed in intersections. Figure 2. Inductive loop sensors. trolling intersection s at different hours of a day. Figure 3. 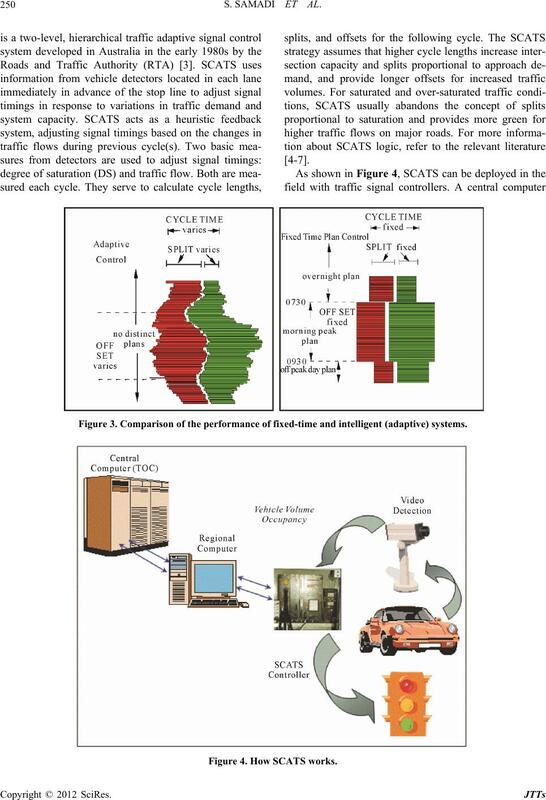 Comparison of the performance of fixed-time and intelligent (adaptive) systems. Figure 4. How SCATS works. signal timings from local controllers are implemented. connect to a single regional computer simultaneously. pacts of the system on the defined measures. the help of probe vehicles and statistical techniques. also possible, i f nec essa ry. that happens in these conditions should be eliminated. puted in order to define the exact count of movements. N = the number o f r equire d tests. 1) Again, define the necessary movements via Table 1. This time use the calculated average range. 2) Add other movements if necessary. tions and eliminate non-logical values. counted in each of the intervals.  Coordinated versus Local control. tervals, i.e., early morning, end of night, and non-peak. Table 1. 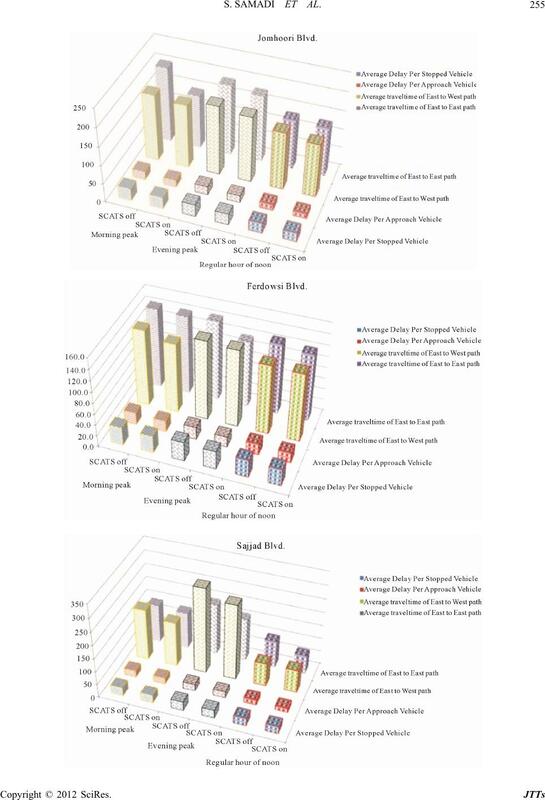 The approximate count and the minimum travels required for travel time study with a reliability of >95%. aIf the value of R has not been mentioned above, recalculate it by interpolation. Figure 5. Selected ro ute s on Mashhad map. end of night, afternoon, and non-peak times. 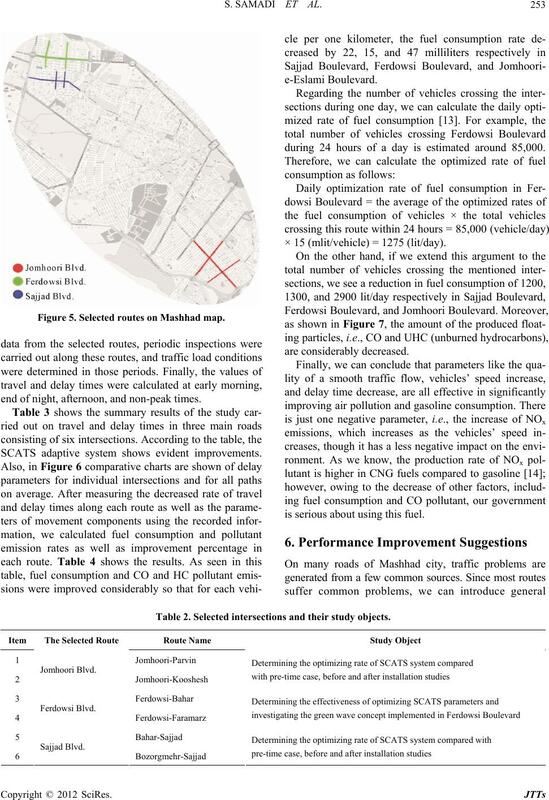 SCATS adaptive system shows evident improvements. during 24 hours of a day is estimated around 85,000. × 15 (mlit/vehicle) = 1275 (lit/day). is serious about using this fuel. Table 2. 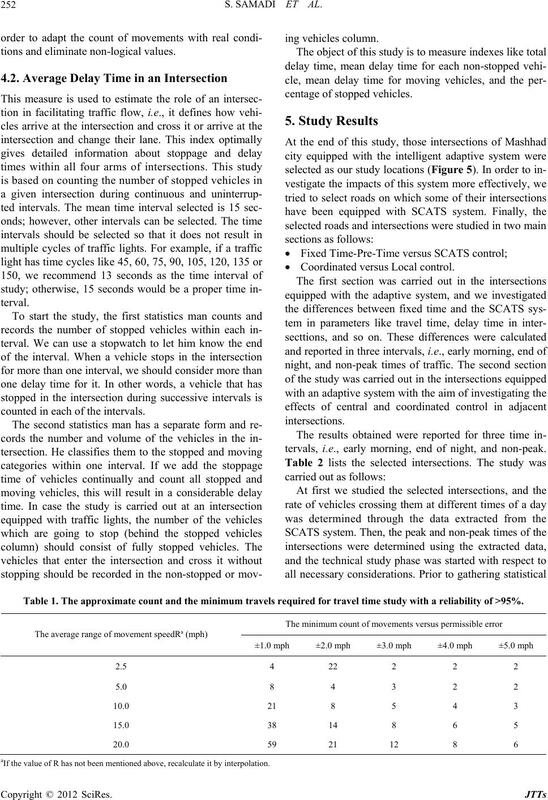 Selected intersections and their study objects. Table 3. 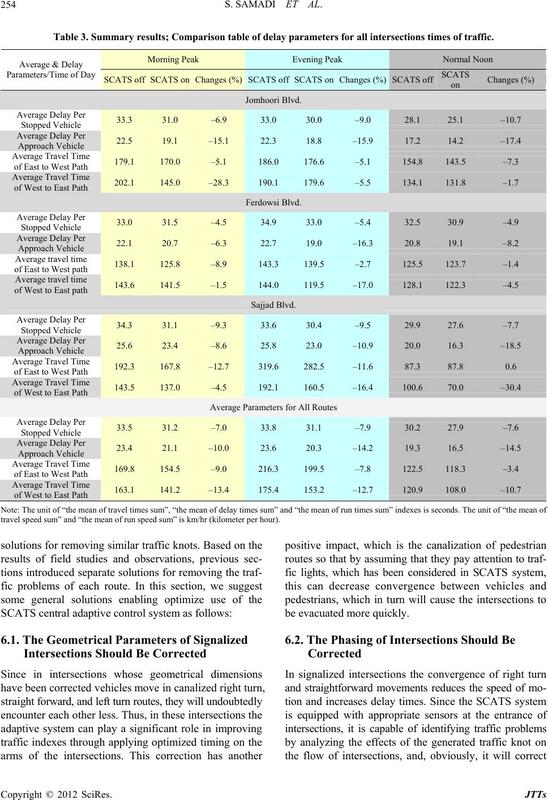 Summary results; Comparison table of delay parameters for all intersections times of traffic. travel speed sum” and “the mean of run speed sum” is km/hr (kilometer per hour). be ev acua ted more quickly. Figure 6. 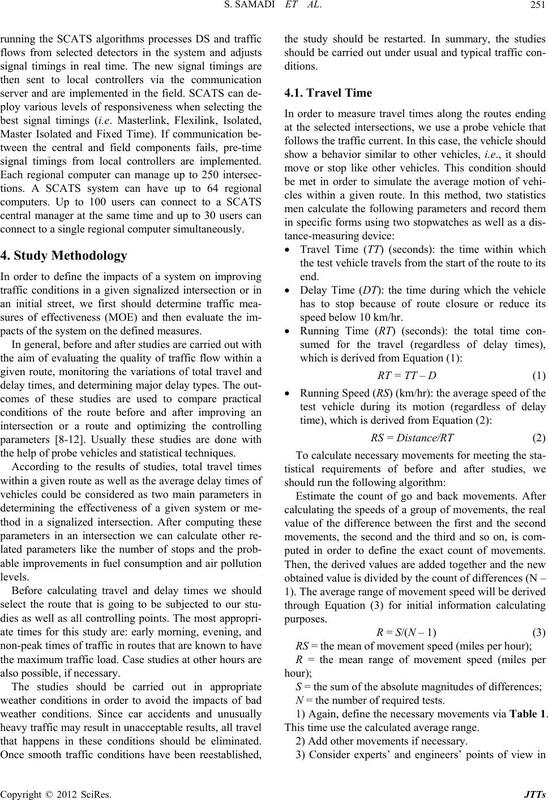 Comparative charts of delay parameters for all intersections. Table 4. 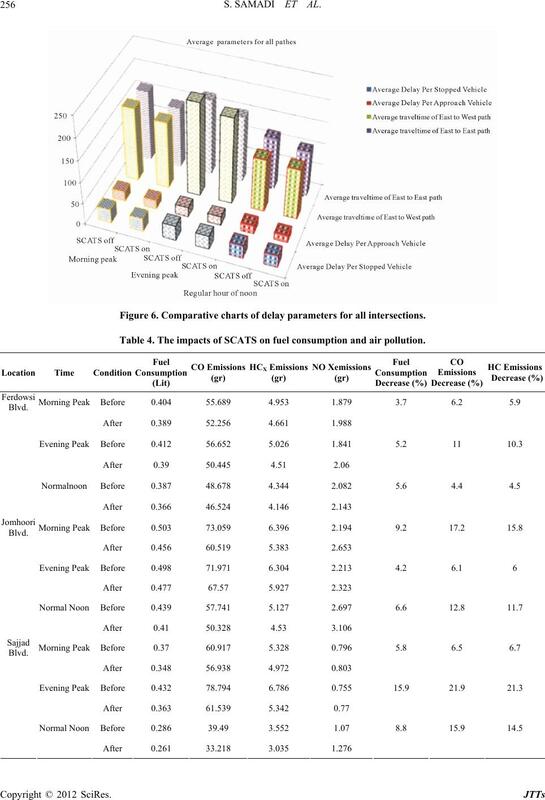 The impacts of SCATS on fuel consumption and air pollution. Figure 7. 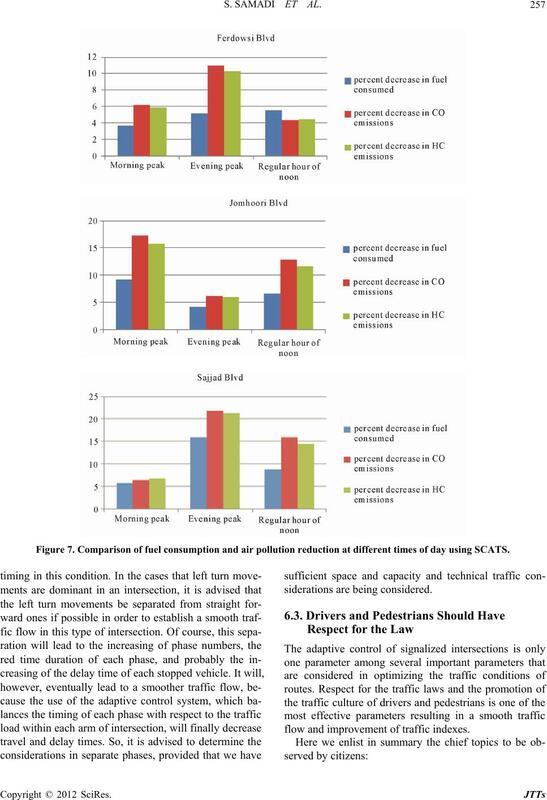 Comparison of fuel consumption and air pollution reduction at different times of day using SCATS. flow and improvement of traffic indexes. after and before the intersection’s limits.  They should not double park in drive bands. drive at safe speed limits. intersections and heavy traffic roads. using peripheral software like the SCATS traffic reporter. in the design and maintenance phases. not solely depend on this parameter. ment of the system are also given at the end of the paper. Record, No 1494, 1995, pp. 98-105.
tion,” 2nd editon, Prentice-Hall, Upper Saddle River, 1998.
ciety, 5-8 November 2002, pp. 3103-3106.
tion Development Conference, April 18-20, 2003.